On September 1st we released our new and improved algorithmic trading strategies. Last week the market started with a huge gap down at the open along with a spike in volatility. This price action shocked the market had a few sideways narrow range days which makes it difficult to pull money out of the market. Overall the algorithmic trading strategies executed trades just as they should, although we ended the week with a drawdown of roughly $1600 depending on your fill price. Each trading day last week the market had large opening gaps and volatility which caused some slippage for getting in and out of a couple trades, but overall things are looking great. Also last week was a short week for the systems as they only traded three days. This week will be another short week with Labor Day Monday Holiday. Take a look at the chart below and annotations. 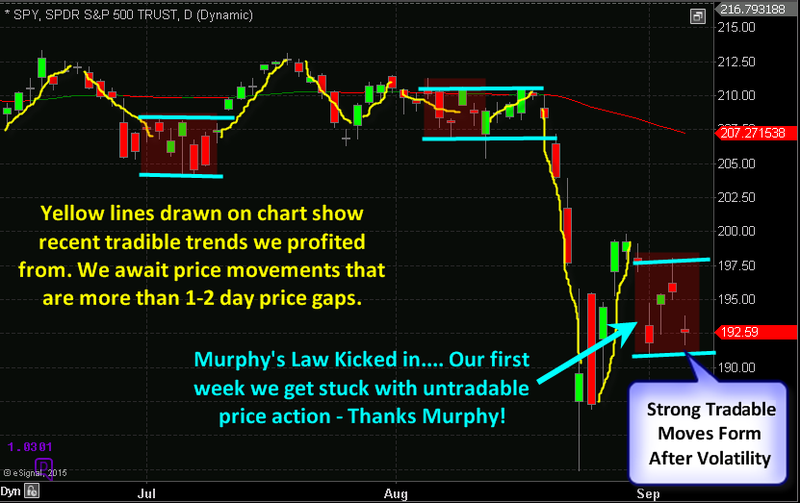 It paints a clear picture of what the market is doing and why we had the results we had. While we could still be in store for a few more days of wild trendless price gaps the overall daily chart pattern is pointing to a massive move in either direction soon and one of our strategies should catch the move and likely pull our trading accounts to new highs potentially with one trade. With that said the market always finds way to make things difficult and if you have been trading for any length of time you know that there is no way to catch every big move in the market. We simply take what the market gives us and enjoy the ride.